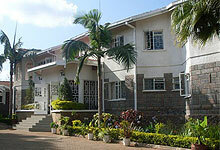 Bush House & Camp Guest House Nairobi is an award winning Nairobi guest house offering quality budget accommodation located in the Karen, serene up-market suburb of Nairobi, Kenya. Just 16 Kilometers from Jomo Kenyatta International Airport, Bush House & Camp is in close proximity to leading Nairobi attractions. Airport transfer from Nairobi Jomo Kenyatta International airport or Wilson airport to Bush House and Camp Guest House or transfer from Bush House and Camp Guest House to Nairobi Jomo Kenyatta International airport or Wilson airport.